Take our signature tour and let Central Park Conservancy Guides give you an insider's look at some of the most iconic features of the world's greatest urban park. Learn how rocky, swampy land was built into the living work of art that is Central Park today. Visit some of the Park’s most iconic landmarks including, the Dairy, Sheep Meadow, Cherry Hill, the Lake, Bow Bridge, Bethesda Terrace, the Mall, and Literary Walk. Meet: Dairy Visitor Center & Gift Shop (mid-Park between 64th and 65th Streets). 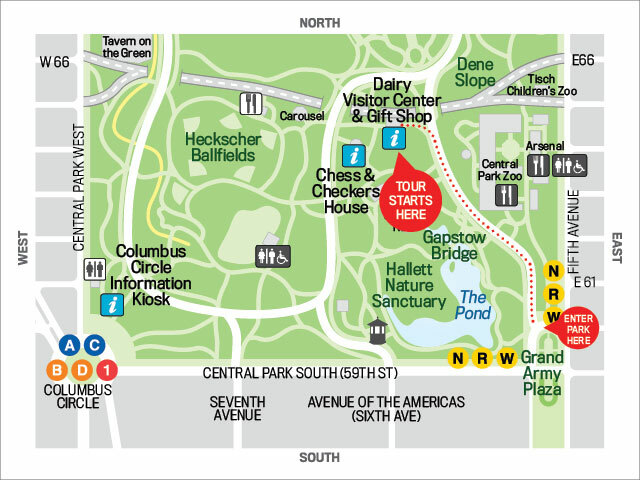 Enter the Park at 60th Street and Fifth Avenue, and follow the path adjacent to the drive (road) north; the Dairy will be on your left. Please note Google Maps does not recognize this location. Map of start location.